Our previous yard had huge cottonwood trees, some of which had died and been cut down. When we moved, I decided to take a stump with me. It was in about three pieces, but I knew it would make a great flower planter. 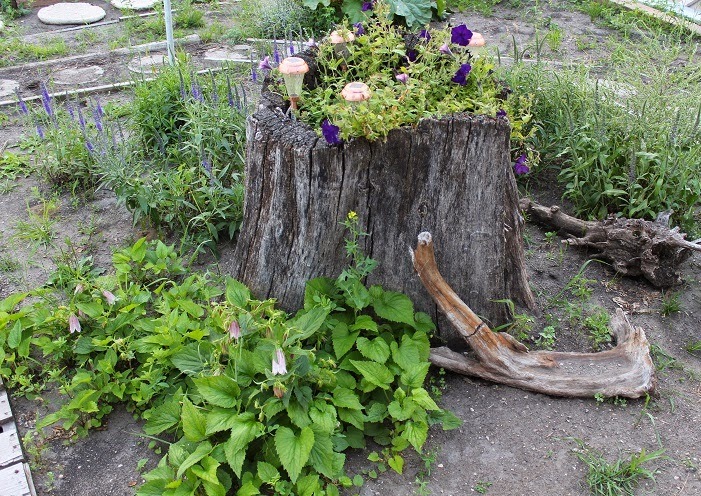 The year after we moved (2013), we 'planted' the stump. I'm sure Brian thought I was crazy for bringing it along, but he still found a way to wire the pieces together for me. 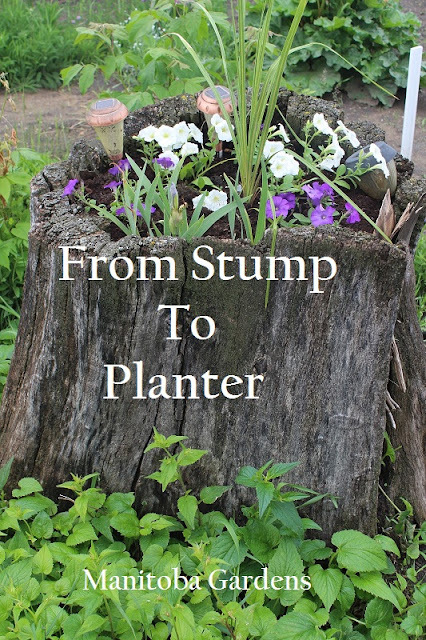 Once the stump was in place, we brought in some top soil to fill it, and to spread around it. Since then, I've topped it up with compost and peat moss. This picture shows the finished planter, along with some driftwood around it. In the background, you can see an unfinished pallet walkway...that, and the concrete stepping stones will have to be a post for another day. We still have them, but they've been moved. A year later, the perennials around the stump have begun to spread. The solar lights among the flowers light up the area at night. The weeds are already starting to move in! By the third year, the perennials had started to fill in around the stump. 3rd year. 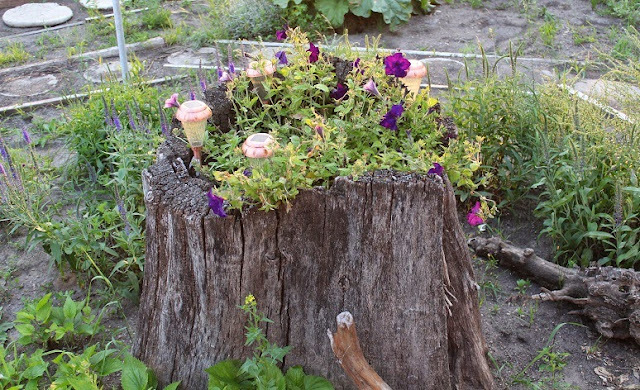 Petunias in stump, perennials all around. The perennial in front is called Pink Chimes Bellflower. This year (4th year) the stump is completely surrounded by perennials. The old stump looks as if it's always been here. I'm happy to see a couple of maples growing up to take it's place! 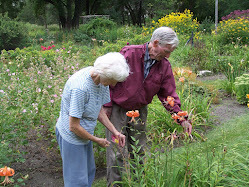 This year we added some irises, and I forget the name of the spikey plant Brian bought for the center! The stump is getting a little weather worn. I think if I was doing it again, I'd try to give it some kind of coating to make it last a little longer. I might have to go out hunting for a new old stump one of these days!